As mentioned yesterday, there are 5 restaurants that we can choose to have breakfast at. We decided to go with Ocean Blue restaurant as it was the least crowded. Got us a table next to the window with an awesome view of the ocean! After breakfast, it started to rain ☔! 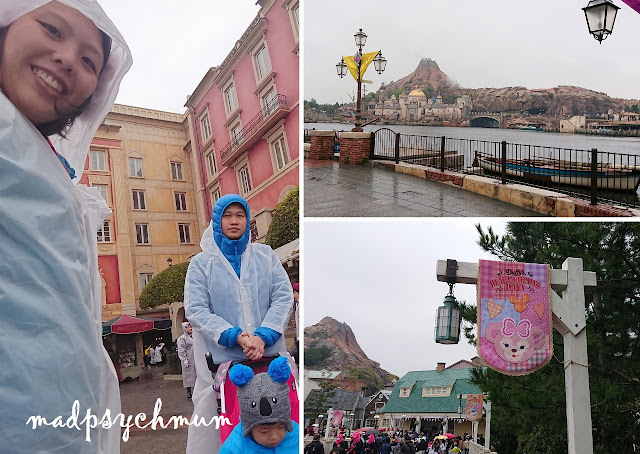 We clothed ourselves with our raincoats that we got from Daiso Izukogen 3 days ago and headed to Tokyo DisneySea. As we only had one day, we chose Tokyo DisneySea over Tokyo Disneyland as there is only one DisneySea in the world! It definitely pays to be prepared for wet weather because we only paid ¥100 each for our raincoats while everyone else had to buy the exact same thing at ¥500 from the Disney Stores. The kids version that they stocked weren't even half as nice as the Daiso ones yet they were 4 times more expensive! What we were not prepared for, however, was the freezing cold weather! The first thing we did when we arrived was to get the FASTPASS for Toy Story Mania. As we arrived late, we were thankful that they still had FASTPASS, albeit for the last slot of the day! Better than nothing! FASTPASS only available for the final session of the day before the park closes! After getting our FASTPASS, we stumbled upon the Lightning McQueen Parade! The boy's eyes widened with excitement! He loves Lightning McQueen! The boy was so thrilled to see his favourite Cars character! After the very short parade, we decided to go for a boat ride since it was still raining. After the boat ride, we queued at the Marine Life Institute, to ride the Nemo & Friends SeaRider which has incorporated Disney's Nemo and Dory! 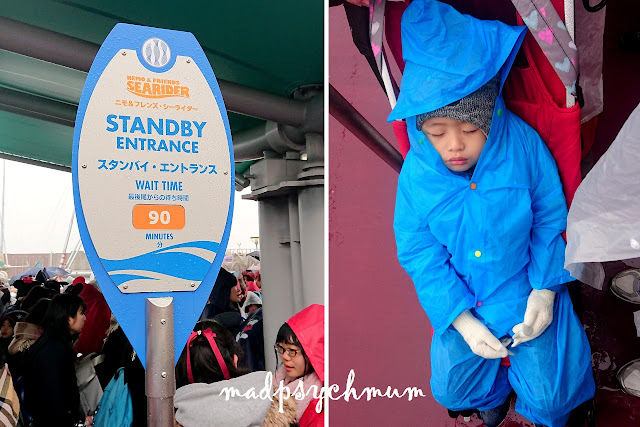 Right: I covered my poor boy from head to toe in raincoat and warm winter wear and he managed to get some sleep despite being drenched from the rain! On hindsight, I should have bought waterproof gloves because his fingers were frozen by the time we reached the front of the queue! The hubby and I had experienced this ride before, only it was called StormRider in the past. I think the new changes to incorporate beloved characters from Finding Nemo and Finding Dory was an awesome move! We loved the new ride even more! The best photo I took of the 4D show! My boy loved the ride! He had so much fun that we almost wanted to ride it again but didn't because we weren't going to queue for another 90 minutes! On hindsight, I should have taken the FASTPASS to ride it again later in the day. 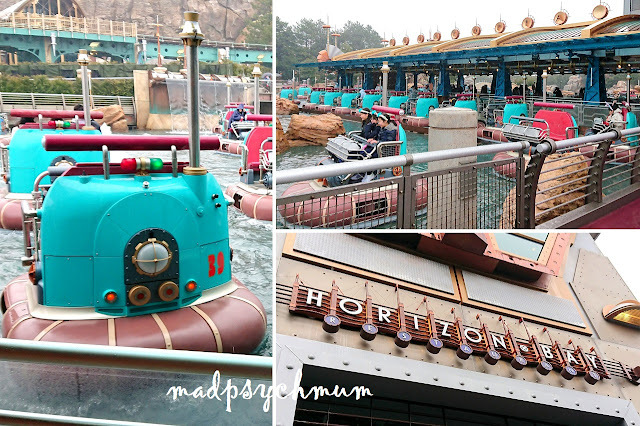 In any case, we rode the Horizon Bay ride next as it was located beside the Marine Life Institute. There was no queue for this ride as you need to have a raincoat in order to ride it! That was all the rides we experienced at DisneySea, at least in the day. 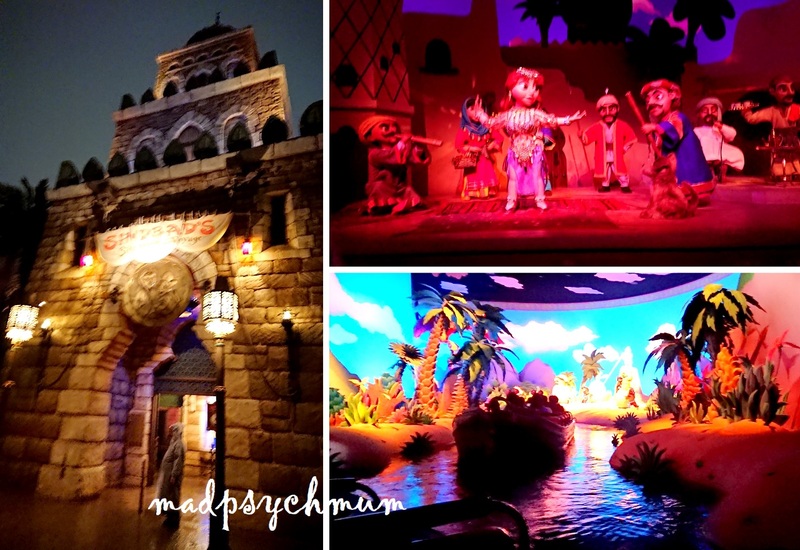 Ride the Indian Jones Adventure again because I really loved it the last time! 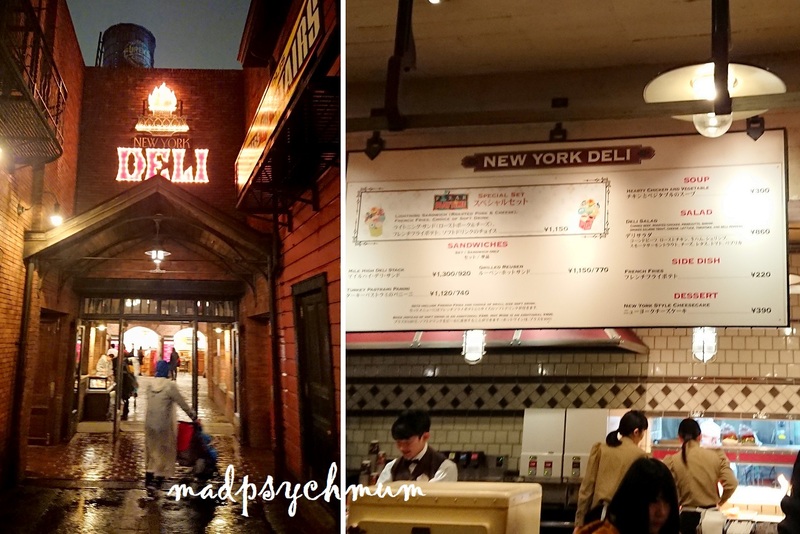 So anyway, we explored the rest of DisneySea trying our best to get over our disappointment at the rides and the constant rain (yes again! I don't know why it likes to rain on our parade on the days that we need it NOT to! *grrr* 😠). 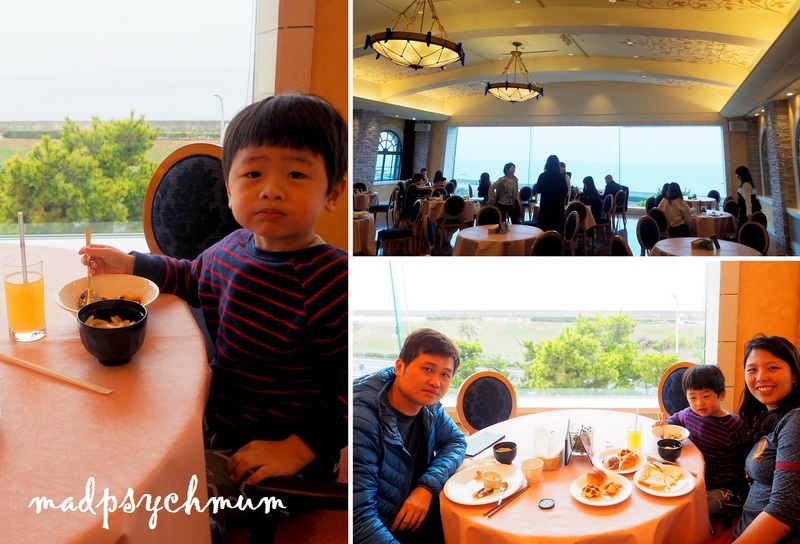 We finally had enough of the rain and decided to take shelter and have lunch at the Horizon Bay Restaurant. We realised that it was actually very affordable to dine with Disney characters here but as we didn't book in advance, we had to queue with everyone else. I made a mental note to book a character dining the next time we visited! Right: the boy's kids meal. 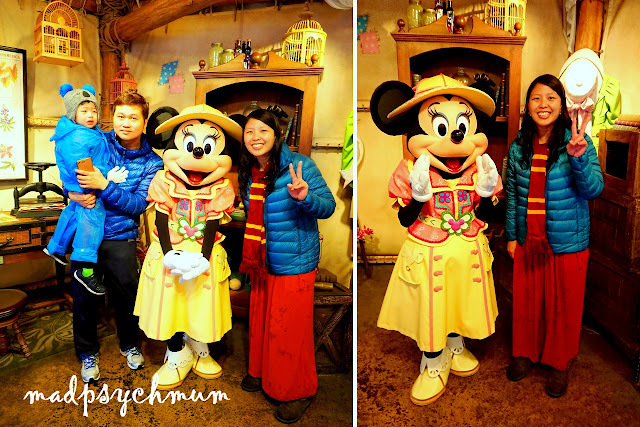 After lunch, we continued walking around and stumbled upon the queue to meet Minnie Mouse! Although we had to queue in the pouring rain, the bright side is that we only had to queue for 20 minutes precisely because it was raining. After the photo with Minnie, the hubby decided that he has had enough and we needed to return to our hotel for a short time out. We stopped by Ikspiari to buy some food for our dinner at our hotel room. 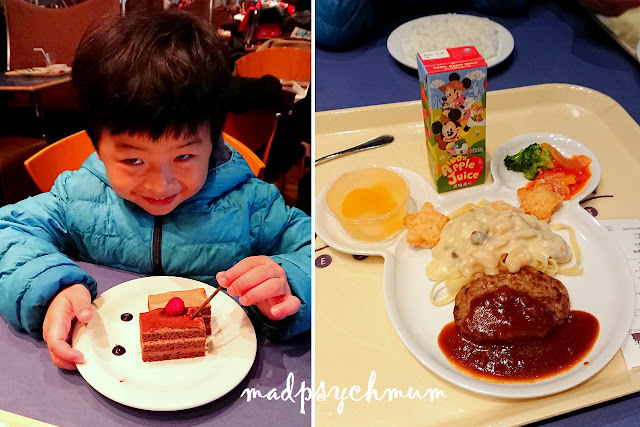 We took a warm bath and had dinner in our hotel room before heading back to DisneySea in the evening (one of the many benefits of staying at Tokyo Bay). 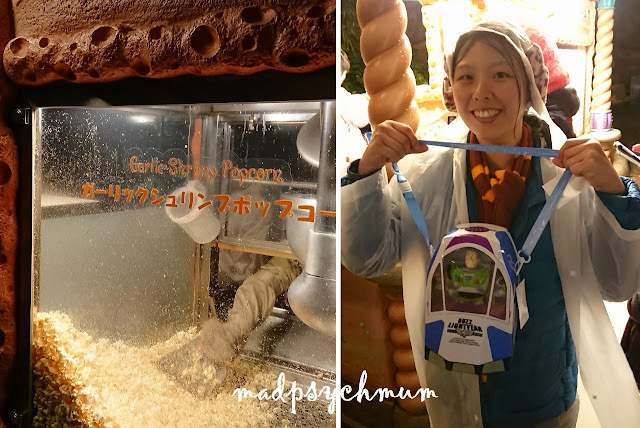 We headed straight to get Garlic-Shrimp Popcorn that came in a really cool Buzz Light Year rocket! Super cute! 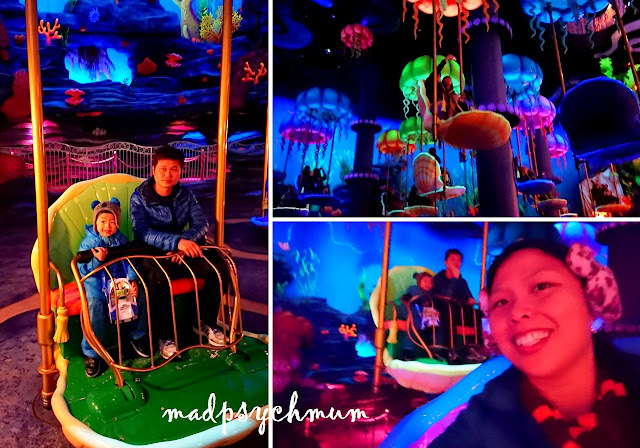 We headed to the beautifully lit Triton's Kingdom for more rides. 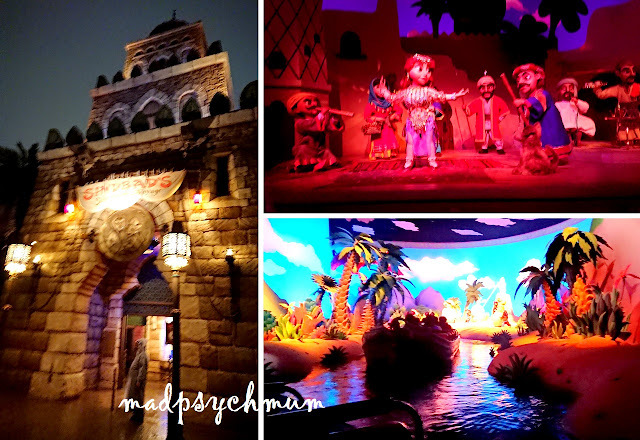 After shopping for souvenirs, we rode the Sinbad boat ride. After the show, we had time to kill so we had a little snack at the Deli. 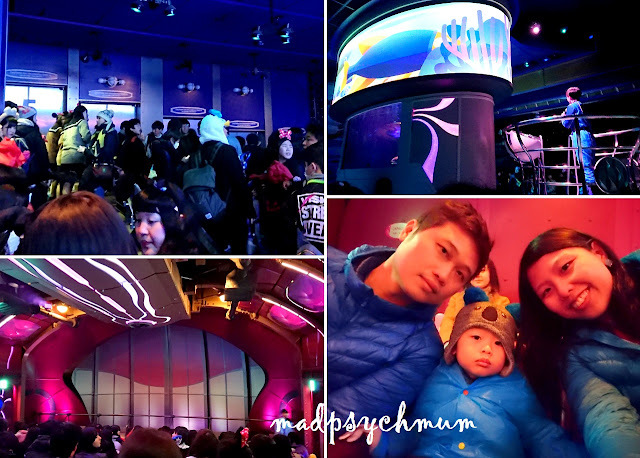 It was finally 9.35pm and we could go for our Toy Story Mania ride! We were given 3D glasses to wear. The boy was so amused with his glasses! The boy loved this ride even though he didn't get a single point! He just had fun watching daddy shoot! It was definitely worth staying back for this attraction just to see the look of joy on the faces of the father and son. The boy playing Blazing Buckaroo outside Toy Story Mania. Had a blast stomping his feet to get points! 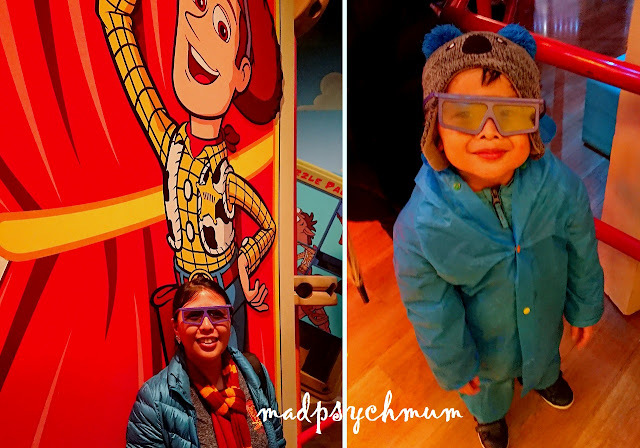 The best consolation for the worst Disney experience we ever had so far was my boy's continual and fervent enthusiasm the whole day despite the rain. He had an awesome time and was smiling the whole time! His infectious smile and laughter was what pushed the hubby and I to make the most of the situation. If he's not going to let some rain stop him from having a great day at DisneySea with his family, neither are we! My boy in the only 'costume' he owns, which he is soon going to outgrow! 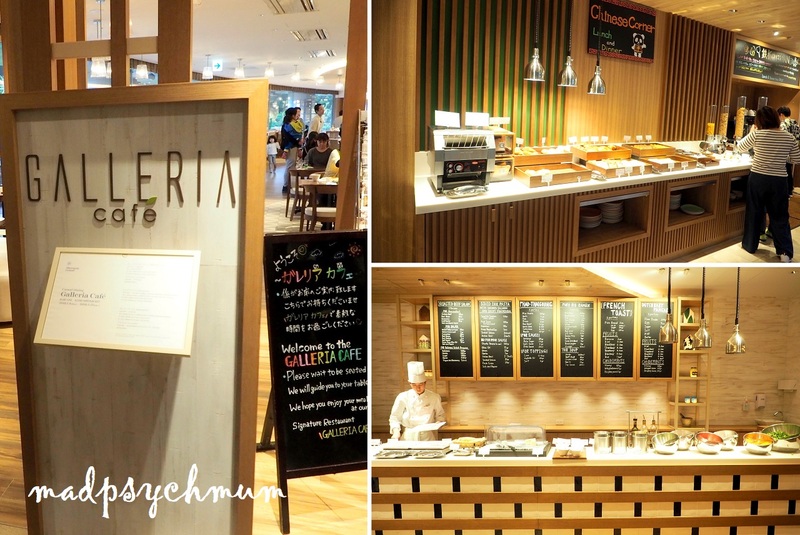 The next morning, we decided to have breakfast at Galleria Cafe, the largest of the 5 restaurants in Sheraton Grande Tokyo Bay Hotel. They have a kids section that served chocolate versions of their mascot! 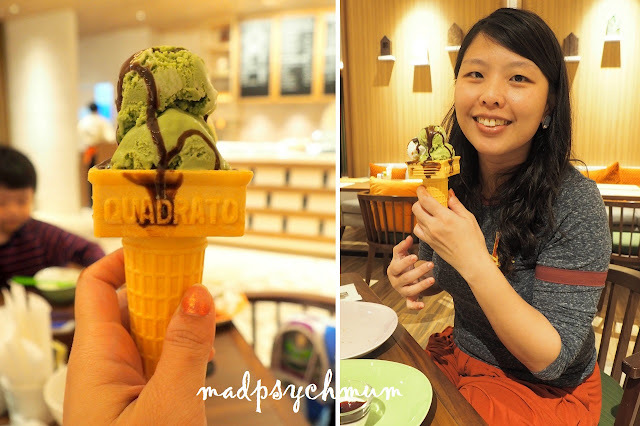 They also had a super awesome ice-cream section! 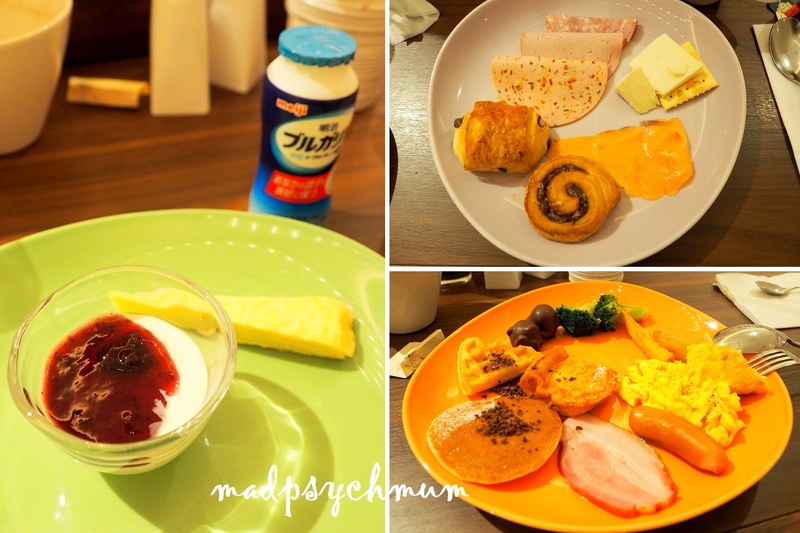 After breakfast, we got ready to check out. 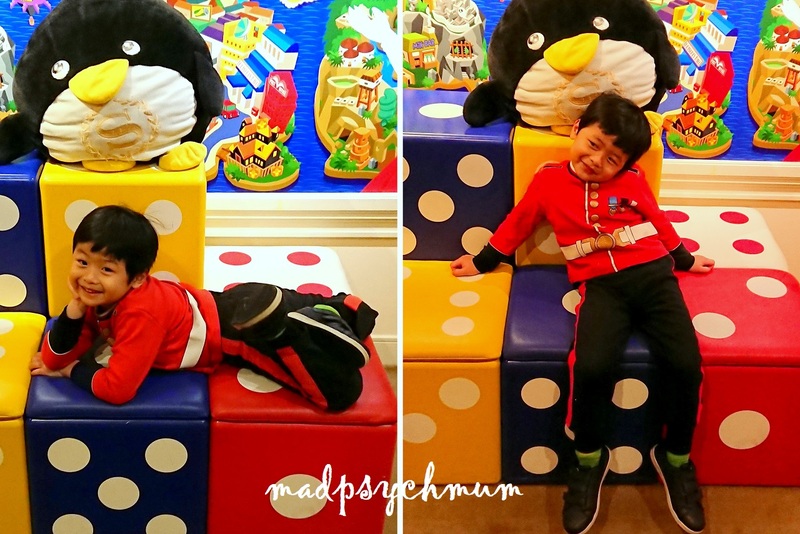 We had time after checking out while waiting to board our bus to the airport so we left our luggage at the concierge and explored the hotel. 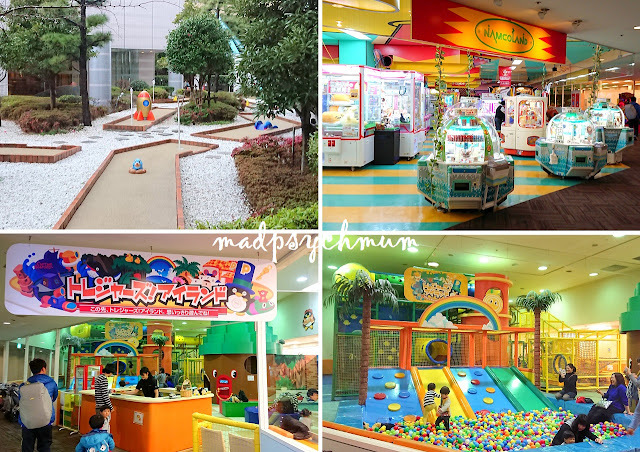 Sheraton Grande Tokyo Bay Hotel is very kid-friendly, with lots of activities for kids. They have got an indoor pool, spa, miniature golf, arcade, photo shoot studio and even an indoor playground! 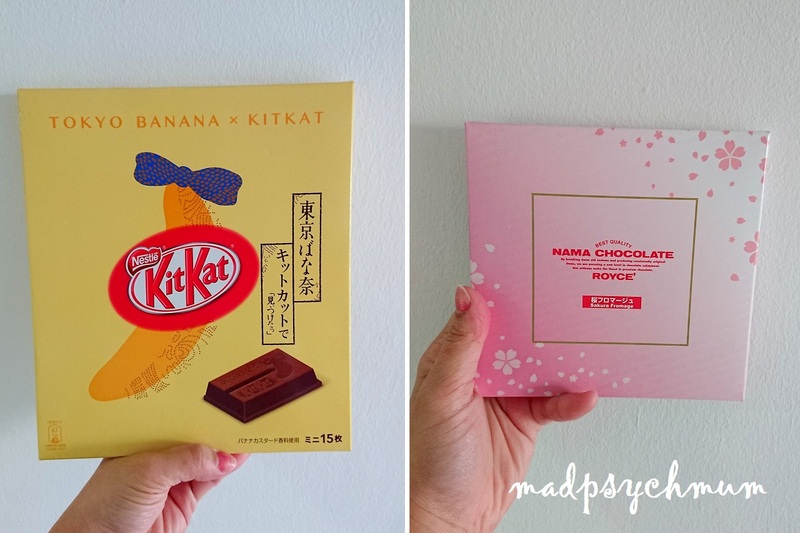 After crossing customs on arrival at the airport, I remembered to pick up my duty free items that I had bought from Ginza. There are a lot of playgrounds located around the airport to entertain kids but beware of letting your kids play if there isn't enough time. I had to drag a crying boy out of a playground because we had to catch our plane! 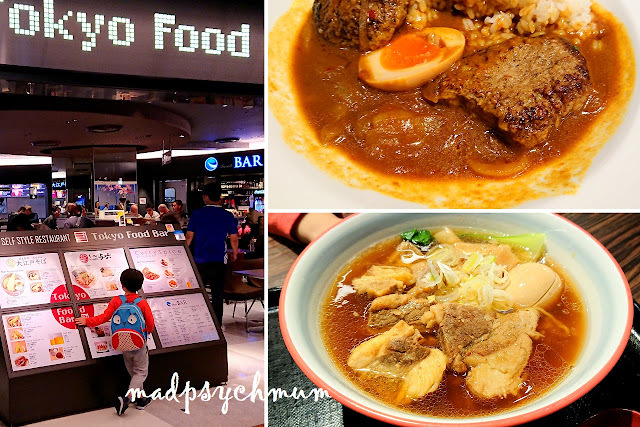 We had our final meal in Tokyo for this trip at the Tokyo Food Bar. We had also just enough time to grab snacks and do last minute shopping!